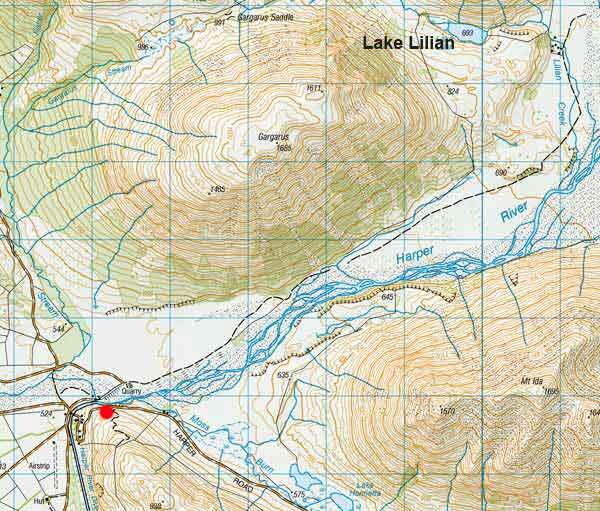 View looking north east towards Lake Lilian taken from the position marked with the red spot on the Harper Road on the map above. You must first cross the Harper River before following the 4x4 track to the left of picture. From the point where the picture was taken to the lake is a distance of approximately 9 km. Lake Lilian is regarded as a good fly fishing water. A small though devoted group of anglers continue to fish this lake on Opening Weekend in November even though they are restricted to foot access only. The walk up the valley is surely worth the effort for the exercise and quality of the magnificent mountain scenery. View looking northeast towards Lake Lilian taken from the position marked with the red spot on the Harper Road on the map above. You must first cross the Harper River before following the 4×4 track to the left of the picture. From the point where the picture was taken to the lake is a distance of approximately 9 km. Be sure to take plenty of warm clothing as the weather can be very cold at times even in high summer. Conversely, it also gets extremely hot as well. So be well prepared for either extreme. There are both rainbow and brown trout present in Lake Lilian but most of the fish are small at not much over 1 kg. Both Fly and Spin Fishing are permitted. Fishing from boats that are not being propelled by a motor is permitted in Lake Lilian – though obviously, you would need a 4×4 vehicle to get your dinghy or kayak to the lake. The fishing season is from the first Saturday in November to 30 April. The daily bag limit is two trout. Preferred flies for Lake Lilian include green and brown beetles, Mrs Simpson, Hamills Killer, Twilight Beauty, and Coch-y-Bondhu. If spin fishing a small black Toby or Glimmy have been successful in the past. A small Veltic or Mepps should also produce the desired result. According to the Glenthorne Station website walking access is permitted along the existing farm track to Lake Lilian and the Avoca River. Each blue square on the map represents 1 km. Permission must first be obtained from Glenthorne Station for vehicle access. Map sourced from NZTopo50-BW20. Crown Copyright Reserved. Lake Lilian is approximately 500m long and 200m wide. Map sourced from NZTopo50-BW20. Crown Copyright Reserved. Walking access across Glenthore Station is permitted along the existing farm track – visible to the left of the picture above – to Lake Lilian and the Avoca River. If walking you must park your vehicle just off the Harper Road and walk northeast up the Harper River to its confluence with the Avoca River. This is a distance of approximately 8km. When reaching the huts on the west bank head upwards to the west behind the Glenthorne Station accommodation building called The Retreat. From there it is approximately another kilometre to Lake Lilian. The lake is exposed to the north-west wind and offers no shelter save for a small group of trees on the southern shoreline. Contact Glenthorne Station for vehicle and mountain-bike access. Walking access is permitted along the existing farm track to Lake Lilian and the Avoca River – refer Glenthorne.co.nz. Harper River The fishing season in the Harper River and its tributaries don’t start until 1 December and runs until the end of April. Fly and Spin fishing are permitted in the Harper and its tributaries with a limit of just one fish. 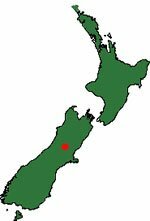 North Canterbury Fish & Game for open season and catch limits. 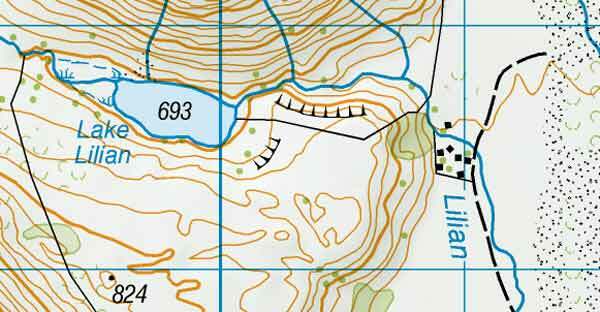 View looking northeast towards Lake Lilian taken from the position marked with the red spot on the Harper Road on the map above. You must first cross the Harper River before following the 4×4 track to the left of the picture. From the point where the picture was taken to the lake is a distance of approximately 9 km. This picture is taken looking up the valley from the position shown with a red spot on the top map above.